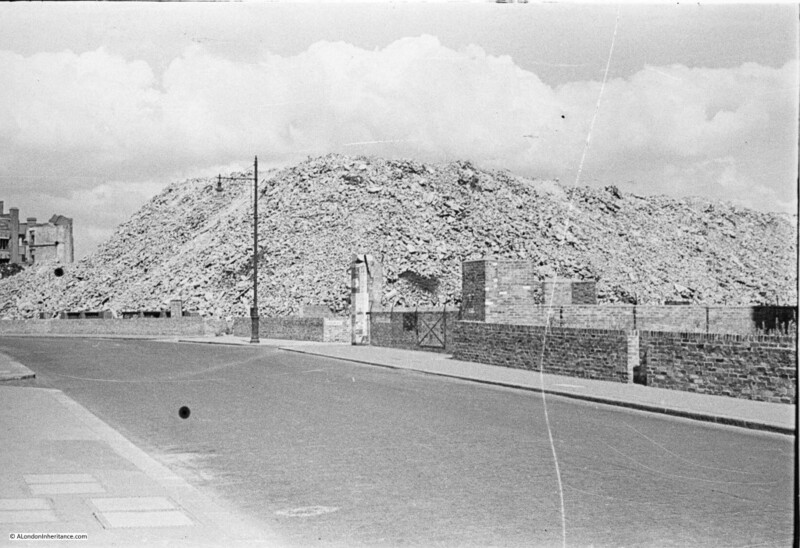 The following photo is from 1947 and shows a street with a very large heap of rubble on the land to the right. When I scanned this negative, I was doubtful as to whether I would find the location. There appears to be a sign on the wall to the left of the pillar in the centre of the photo, but this cannot be read when zooming in due to the definition within the original 35mm film stock. I was sorting through some boxes with photos that my father had printed from the original negatives and I found the same photo, and on the rear was written Aldersgate Street. Although I cannot be sure where on Aldersgate Street the photo was taken, I am very sure that it is looking north. Most of the wartime damage in this area was to the east of Aldersgate Street on the land that would be redeveloped as the Barbican estate. The west, whilst suffering bomb damage did nor suffer the same extensive fire damage caused by incendiary raids. including the one on the 29th December 1940. The huge heap of rubble must be from the buildings demolished on the future site of the Barbican. Comparing the height of the rubble with the lamppost gives some idea of how much must have been removed from the site. It is impossible to know exactly where on Aldersgate Street this photo was taken, but to give an idea of how the area looks now, I took the following photo on Aldersgate Street, looking north. 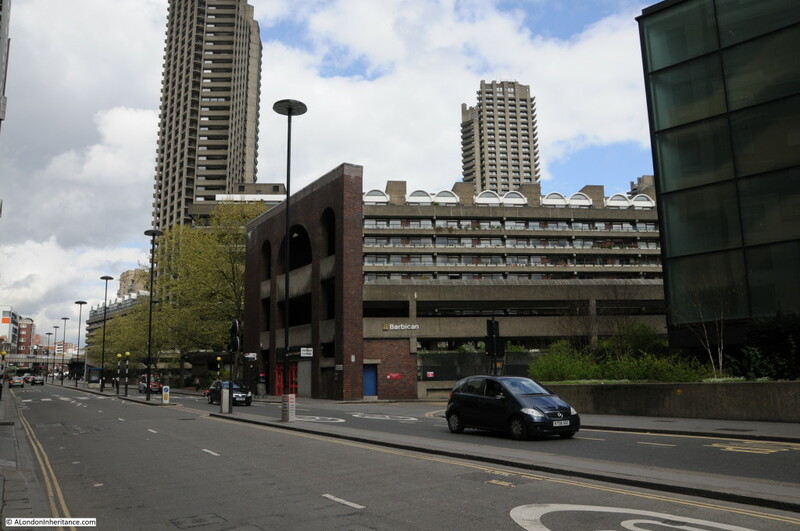 The Barbican development is on the right. The road has been considerably widened, and the photo would have been somewhere along this scene. Aldersgate Street is an old street and was so named after the northern gate of the city. Although originally it did not go any distance as Bishopsgate received the traffic from the north, Aldgate from the east, Newgate from the west and Bridge Gate from the south. 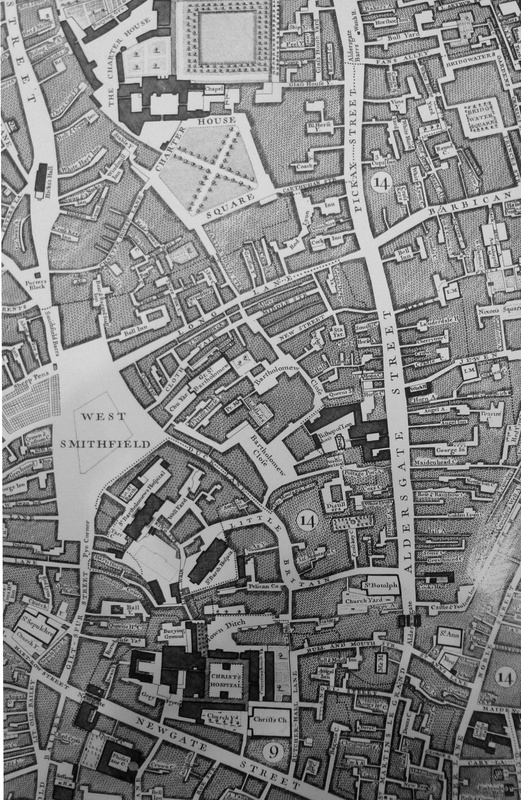 Aldersgate appears to have simply opened out upon moor land, but gained greater significance when it was used as an access point to Smithfield when the area began to be used as a market for horses and cattle and a number of religious establishments. In researching the street, there are a few very different explanations for the name. “Stow’s derivation from the “Elder” or “Older” gate is too far-fetched. It is named probably from one Ealdered, its earliest name being “Aldredesgate”. “We pass next to Aldersgate Street. This thoroughfare is so names from the northern gate of the City, the name of which in turn is derived from the alder trees which once grew around the gate”. A number of recent London street name books I have checked seem to be playing safe by not including Aldersgate Street. I am inclined to go for the Saxon name of Ealdred or Aldred as the source of the name. Fascinating to think that someone living at that time could have given his name to one of London’s major streets, but it also demonstrates the difficult in establishing the truth behind many of the older street names in London and that you should not always believe the explanation given in a single book, always best to seek as much evidence as possible. It is interesting to understand what was on the east site of Aldersgate Street as a large network of streets were lost under the Barbican development. 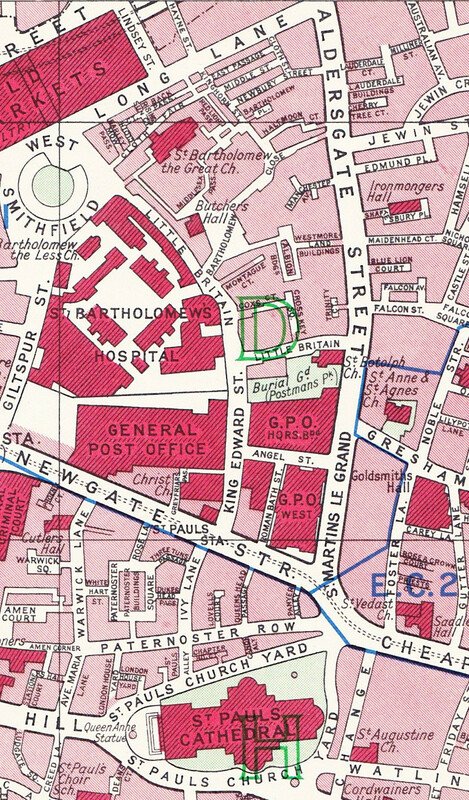 The following map is from the 1940 edition of Bartholomew’s Reference Atlas of Great London. Unfortunately this area is to the edge of the page, but it does show that to the east of Aldersgate Street were a network of streets and courts. All of these have since disappeared, indeed the only remaining landmark is the Ironmongers Hall which is still there, hidden behind the Museum of London which has been built over Maidenhead Court and Blue Lion Court. In 1339 the Chamberlain of Guildhall spent 20s and 4d on the pavement of the gate of Aldersgate, the pavement being one of cobbled stones laid close and rammed. This being an indication that there was a good amount of traffic through Aldersgate as money was only spent on the provision of a cobbled pavement where there was significant traffic. In 1346 a certain Simon is hanged for robbery at Aldersgate. In 1350 there are records of the shops within Aldersgate. In 1391 a scrivener stands in a pillory without Aldersgate for forgery. The original gate was taken down in 1617 and rebuilt to a new design. In honour of the king an equestrian statue was included in the new gate just above the arch. The cost of the new gate was £1,000 and was funded by a bequest from a certain William Parker, Merchant Taylor. 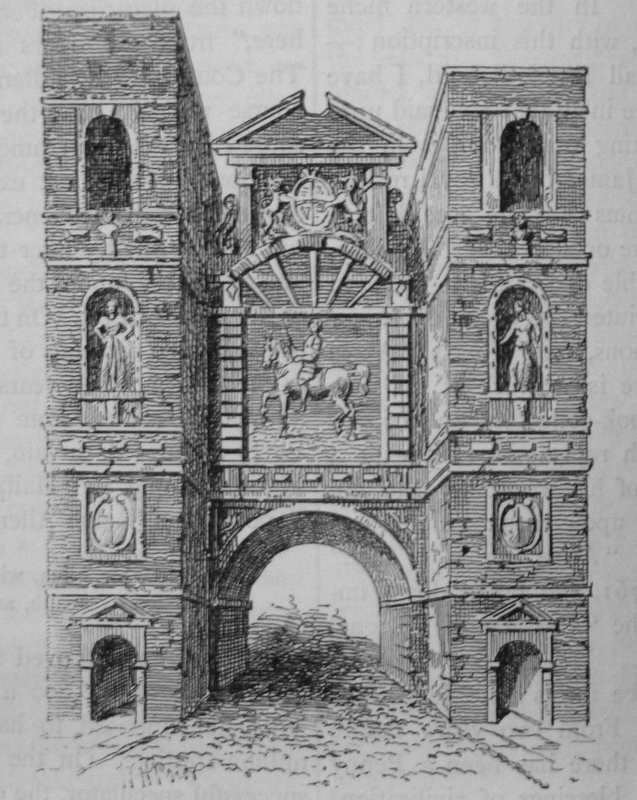 The gate at Aldersgate was removed in 1761. As with other City gates, it was too narrow and restricting on the amount of traffic that was now travelling in and out of the city. 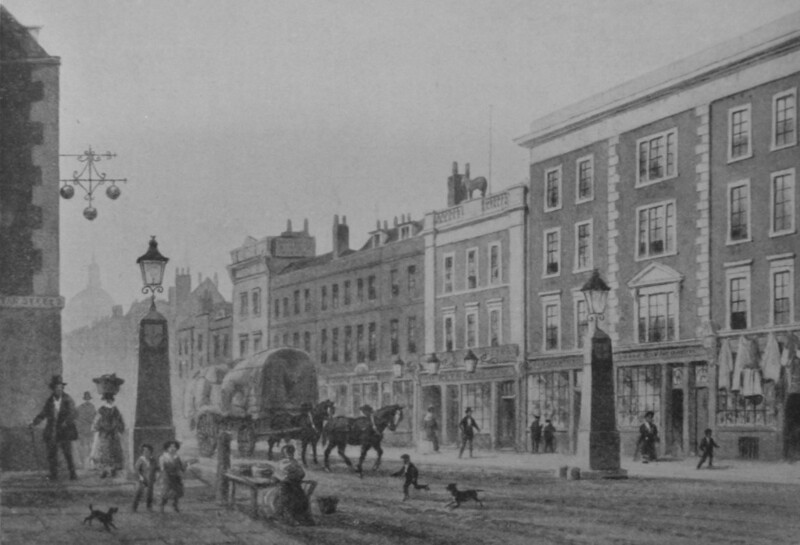 As with many other streets across London, the coming of the railway provided an incentive for new developments and new trades in the local area. 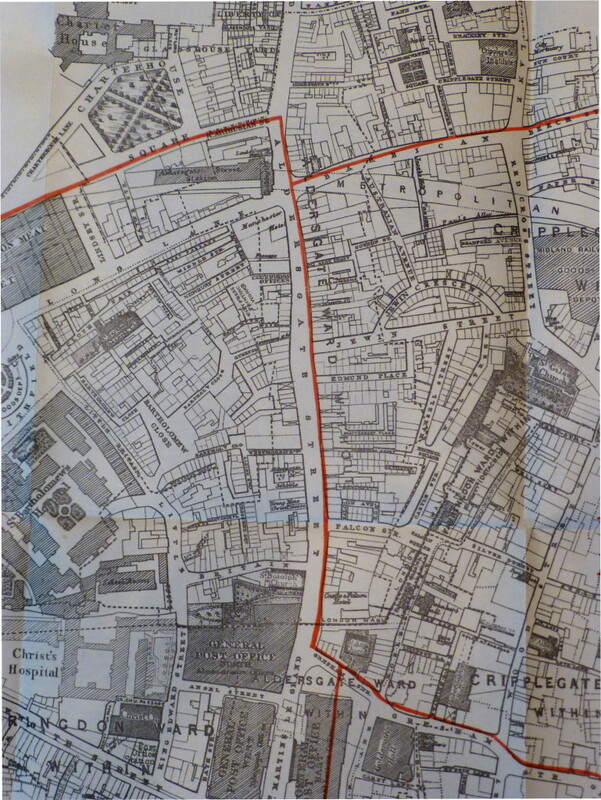 The same book also states that in 1932 the Corporation of London was considering an investment of £1,500,000 to widen Aldersgate Street to 80 feet from St. Martins le Grand to Goswell Road as the road was very narrow. The wartime devastation to the east of Aldersgate Street shown in my father’s photo at the start of this article provided all the opportunity needed to widen the road, and it is this incarnation of Aldersgate Street that we see today. This entry was posted in London Streets, The Bombed City and tagged Aldersgate, Aldersgate Street, Barbican, City Gates on May 17, 2015 by admin. When I first worked in London in the early ’60s there was a typefounder who we used in Aldersgate Street. Behind a small terrace of shops that Stevenson Blake occupied was a huge bomb site with just one building left standing – the fire station. My fellow apprentice told me his father had spent the entire war working in that hell hole. Sorry the link in my other reply does not always work. Thank you very much for posting the article about Alfred Kimbell, a pleasant surprise to wake up to this morning! I had managed to find the article via Pewterbank website but your link makes it much easier. I have read and will re-read the article many times as it gives a fascinating insight into the family and business and the world in which they operated. I don’t know for sure when my grandad came by his 1916/17 American Waltham pocket watch in its H&A Kimbell box but it clearly came from a most reputable and knowledgeable source judging by the article (whether Alice, Henry or Alfred were running the company). My understanding is he came by the watch around that time and I still keep it running in its Kimbell box. I am looking for westmorland building Aldersgate where my gt gt gt grandfather William Knight had his business as a silversmith with brother Samuel. I’m looking for information about 36 Aldersgate St in 1917-1918. I have a phone directory entry from this time for this address for L. Hiegentlich & Co, Essential Oils and Chemicals. I wondered if this would be a business associated with an apothecary and or hospital? Did people live at that address of was it a place of business only? Where can I find further information? Thanks!